Download "MINNESOTA S FUTURE MAPPING. to Shared Opportunities CONTACT"
1 MAPPING MINNESOTA S FUTURE to Shared Opportunities Minnesota enjoys one of the strongest economies in the nation. However, too many of our neighbors are not sharing in the state s economic success. Minnesota s economic future depends on all of Minnesota s workforce reaching their full potential and be being able to make ends meet. 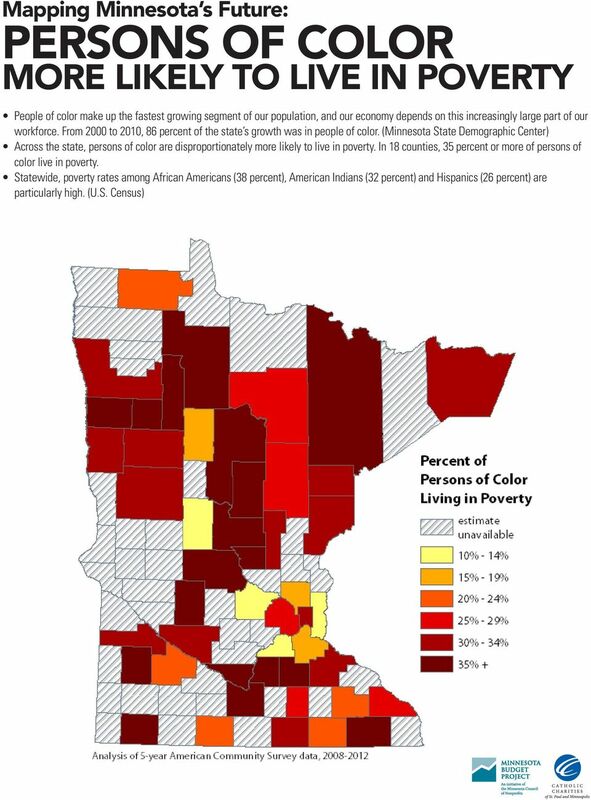 Catholic Charities of Saint Paul and Minneapolis and the Minnesota Budget Project have worked together to create this portfolio of maps to answer questions such as Where is our fight against poverty most needed? and Where do Minnesotans have less education, higher unemployment, or lower incomes? These are important questions to discuss in our communities so that we can build a strong economic future for all of us. Join us to: Gain a better understanding where our state s strengths lie, Identify regional targets for bringing our most vulnerable Minnesotans to safety and security, and Help design the solutions that will provide better futures for all Minnesotans. In this portfolio there are 10 maps that depict the current state of the state as indicated by the Census Bureau s American Community Survey data. These maps are titled: 1. Minnesota Counties 2. Many Minnesotans Have High Housing Costs 3. Not All Minnesotans are Prepared for Good Jobs 4. Poverty in Minnesota: Where is the Greatest Need? 5. Children Living in Poverty 6. Young Adults Living in Poverty 7. Elder Insecurity: Appearances are Deceiving 8. Persons of Color More Likely to Live in Poverty 9. Many Minnesotans are Out of Work 10. Income Inequality across Minnesota 11. Lower Incomes in Much of Greater Minnesota CONTACT Kate Searls (at or Clark Biegler (at with feedback, stories or questions. 3 MANY MINNESOTANS HAVE HIGH HOUSING COSTS High housing costs pose a serious burden for many Minnesota families, and can lead to significant hardship and even homelessness. In 2012, more than 600,000 Minnesota households could not afford their housing. (U.S. Census) Families paying more than 30 percent of their income for housing are considered cost burdened, meaning they cannot afford their housing, according to Federal Guidelines. (U.S. Department of Housing and Urban Development) This map shows the percent of households in each county who pay 30 percent or more of their incomes on housing. 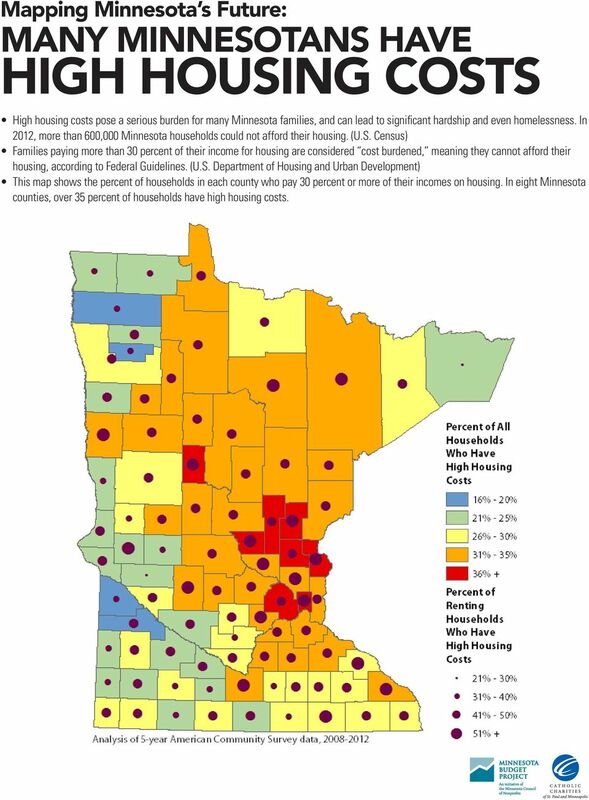 In eight Minnesota counties, over 35 percent of households have high housing costs. 4 NOT ALL MINNESOTANS ARE PREPARED FOR GOOD JOBS Significant portions of the state may lack the trained workforce needed for economic success. In 47 counties, 46 percent or more of adults age 25 and older don t have any post-secondary education. The Twin Cities Metro counties and Olmsted County (where Rochester and the Mayo Clinic are located) have the highest shares of adults with post-high school education. It s important for workers to receive the education and training they need to compete in today s workforce, and so Minnesota can attract the high quality jobs crucial for our economic success. 5 POVERTY IN MINNESOTA: WHERE IS THE GREATEST NEED? 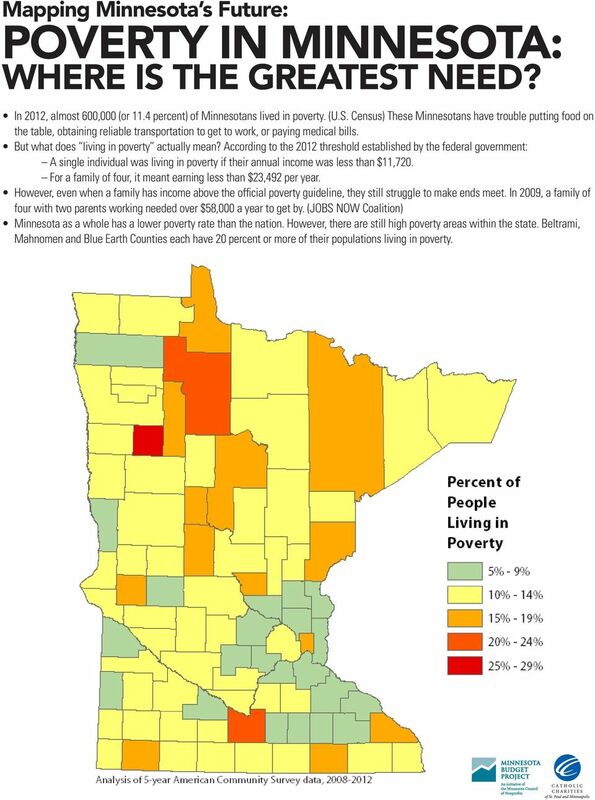 In 2012, almost 600,000 (or 11.4 percent) of Minnesotans lived in poverty. (U.S. Census) These Minnesotans have trouble putting food on the table, obtaining reliable transportation to get to work, or paying medical bills. But what does living in poverty actually mean? According to the 2012 threshold established by the federal government: A single individual was living in poverty if their annual income was less than $11,720. For a family of four, it meant earning less than $23,492 per year. However, even when a family has income above the official poverty guideline, they still struggle to make ends meet. In 2009, a family of four with two parents working needed over $58,000 a year to get by. (JOBS NOW Coalition) Minnesota as a whole has a lower poverty rate than the nation. However, there are still high poverty areas within the state. Beltrami, Mahnomen and Blue Earth Counties each have 20 percent or more of their populations living in poverty. 6 CHILDREN LIVING IN POVERTY Children living in poverty have serious disadvantages, such as inadequate nutrition and housing. Child poverty can also have serious long-term effects on health, academic success and adult earning potential. (American Psychological Association) Poverty is more common among children than other age groups. In 2012, nearly 1 in 5 pre-schoolers in Minnesota lived in poverty. In contrast, 1 in 13 Minnesotans in their prime working years (ages 45-64) lived in poverty. 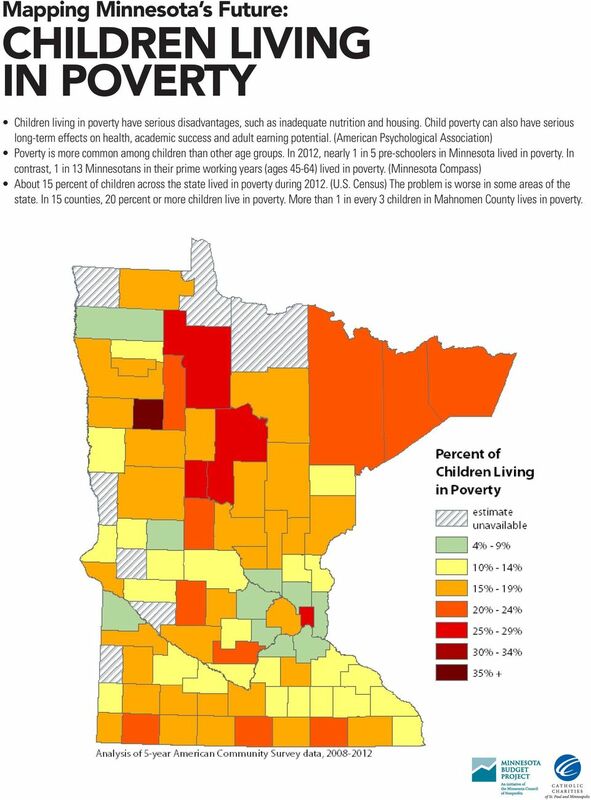 (Minnesota Compass) About 15 percent of children across the state lived in poverty during (U.S. Census) The problem is worse in some areas of the state. In 15 counties, 20 percent or more children live in poverty. More than 1 in every 3 children in Mahnomen County lives in poverty. 7 YOUNG ADULTS LIVING IN POVERTY Many of Minnesota s young people are living in poverty. Some of this is due to young Minnesotans not finding work, which means a significant setback at a critical time in their lives that may harm their future earnings. 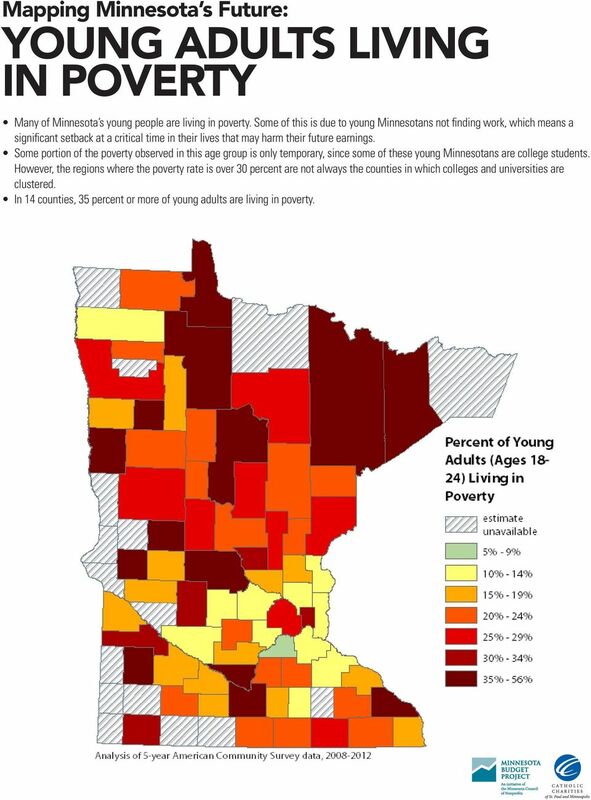 Some portion of the poverty observed in this age group is only temporary, since some of these young Minnesotans are college students. However, the regions where the poverty rate is over 30 percent are not always the counties in which colleges and universities are clustered. In 14 counties, 35 percent or more of young adults are living in poverty. 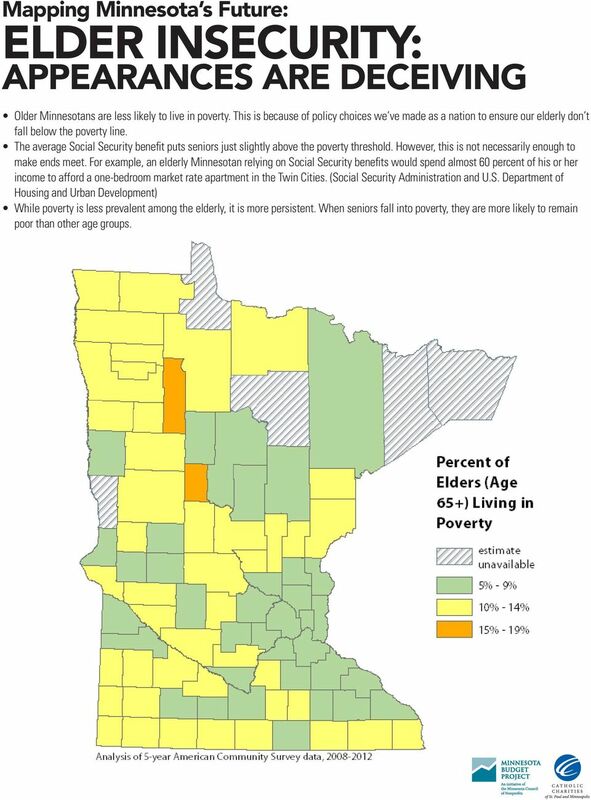 8 ELDER INSECURITY: APPEARANCES ARE DECEIVING Older Minnesotans are less likely to live in poverty. This is because of policy choices we ve made as a nation to ensure our elderly don t fall below the poverty line. The average Social Security benefit puts seniors just slightly above the poverty threshold. However, this is not necessarily enough to make ends meet. For example, an elderly Minnesotan relying on Social Security benefits would spend almost 60 percent of his or her income to afford a one-bedroom market rate apartment in the Twin Cities. (Social Security Administration and U.S. Department of Housing and Urban Development) While poverty is less prevalent among the elderly, it is more persistent. When seniors fall into poverty, they are more likely to remain poor than other age groups. 11 INCOME INEQUALITY ACROSS MINNESOTA Income inequality refers to the degree to which income is unevenly distributed throughout a community. 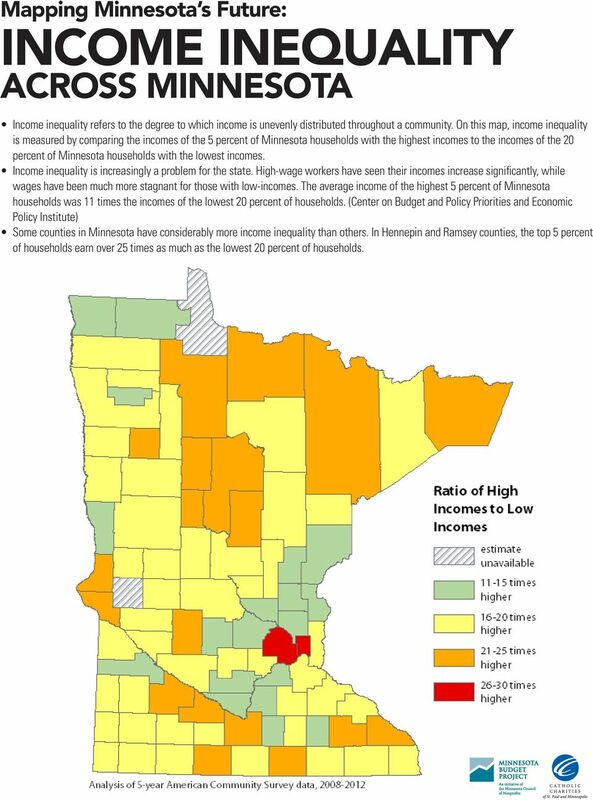 On this map, income inequality is measured by comparing the incomes of the 5 percent of Minnesota households with the highest incomes to the incomes of the 20 percent of Minnesota households with the lowest incomes. Income inequality is increasingly a problem for the state. High-wage workers have seen their incomes increase significantly, while wages have been much more stagnant for those with low-incomes. The average income of the highest 5 percent of Minnesota households was 11 times the incomes of the lowest 20 percent of households. 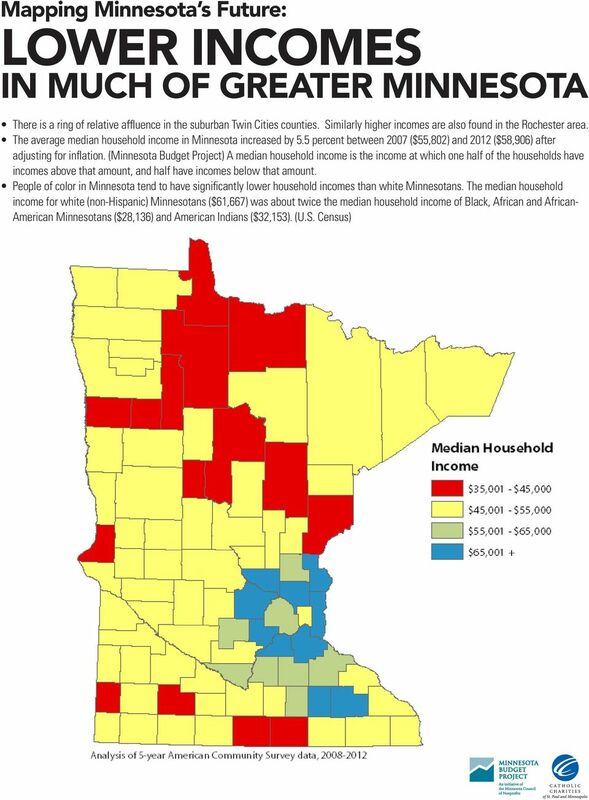 (Center on Budget and Policy Priorities and Economic Policy Institute) Some counties in Minnesota have considerably more income inequality than others. In Hennepin and Ramsey counties, the top 5 percent of households earn over 25 times as much as the lowest 20 percent of households. Twin Cities in Crisis: Unequal Treatment of Communities of Color in Mortgage Lending. Institute on Metropolitan Opportunity. In a series of policy briefs last year, CBC examined housing affordability across large U.S. I. B. SOCIOECONOMIC CHARACTERISTICS 1. HOW FINANCIALLY SECURE ARE RESIDENTS OF DELAWARE? Delaware residents median household incomes are lower than comparison communities but higher than national norms. Where Will Rural Baby Boomers Live in Their Later Years? A Briefing Paper Prepared for the Council on Contemporary Families for Older Americans Month. Eric Klinenberg New York University. Who is making ends meet in the Portland region? The entire Title VI report for the West Suburban Service Changes concept plan is available online.